This article gives you complete details about Uncharted 3: Drake's Deception which is the latest release in Play station 3 platform. More details about the review and game details are quoted in this article. Read the article full for more details. All are waiting for the release of Uncharted 3: Drake's Deception which is the third edition in Uncharted series. Uncharted 3: Drake's Deception will be released only on Play station 3. Previous versions of Uncharted games are already hit and popular. The main feature of this game is its realistic graphics and technology. Uncharted 3: Drake's Deception includes multiplayer gaming mode. The release date of Uncharted 3: Drake's Deception is expected on November 2011. 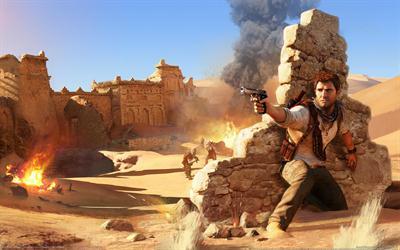 Uncharted 3: Drake's Deception is one of the highly rated video game in 2011. The developer of Uncharted 3: Drake's Deception is Naughty Dog and the publisher of the game was Sony Computer Entertainment. The game was designed by Richard Lemarchand and composed by Greg Edmonson. This Third person shooter game has got best gameplay and mind blowing stages. Player has to control Nathan Drake who can jump, sprint, climb, swim, scale narrow ledges and also got special combat and actions to attack two enemies at a time. Nathan Drake can take and use weapons to kill the enemies. The game contains hidden treasures and collectables to unlock special features in the game. These treasures can be also used to unlock characters and weapons in the game. The story of the game take place in Rub' al Khali desert. More details about the review and ratings of Uncharted 3: Drake's Deception is given below. Uncharted 3: Drake's Deception review by different websites and magazines are given below.